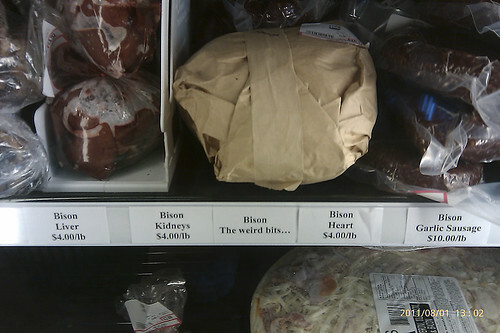 I guess if I ever need any weird bison bits, I know where to go. After our success with the first one, we decided to try our hands at grilling another pizza this evening. The first was a very simple one consisting of little more than tomatoes, basil and cheese. For the second pizza we went a bit more elaborate. 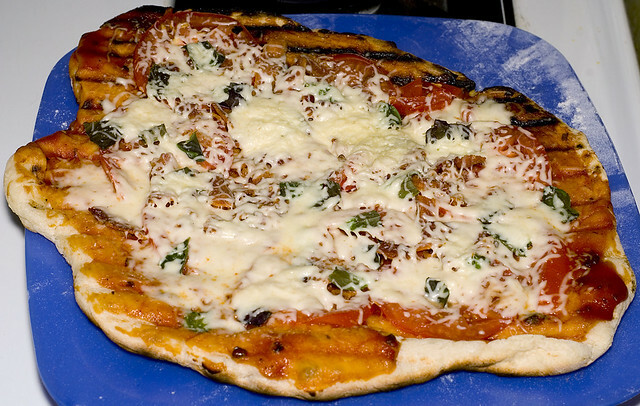 The crust is mostly a standard pizza crust, with a bit of powdered mozzarella cheese added for flavour and tensile strength. We slapped it on the grill for a couple of minutes, then flipped it and added the toppings. For sauce we used a local roasted jalapeño barbecue sauce (note: this stuff makes astonishingly good pizza sauce) and then covered with with thin-sliced local tomatoes, red and sweet basil from our garden, crispy local bacon, and a generous sprinkling of mozzarella cheese. The plan had been to included roasted local garlic as well, but we forgot to roast the garlic and had to run without. In the end it didn't really need the garlic, but it would have been a nice touch.